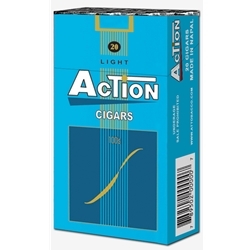 Action Light Cigars uses a light blend of great quality, yet tobacco that gives it a great, smooth flavor. Each Action Filtered Cigar is wrapped in a natural tobacco paper which offers a smoker the satisfaction of an all-natural taste and flavor each and every time. THESE ARE GOLD NOW NO LONGER BLUE!